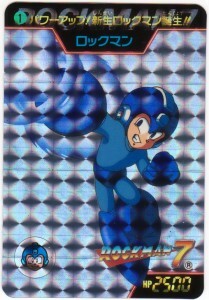 To celebrate, here’s Rockman Carddas #211 which sought to revitalize the card series with a theme of Rockman’s rebirth! 1. Power Up! Rockman Reborn!! But, not everyone is quite so enthusiastic that Rockman has seen another year or continued existence. For the past 23 years, Rockman’s arch-villain and nemesis Dr. Albert Wily has tried and failed time and again to best our hero. 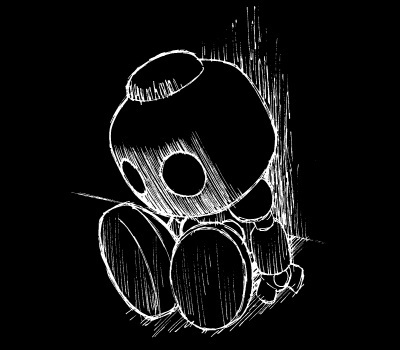 But despite all these defeats, Wily never gives up! And in that regard, he is as much to thank for the series’ longevity as any character, if not more! 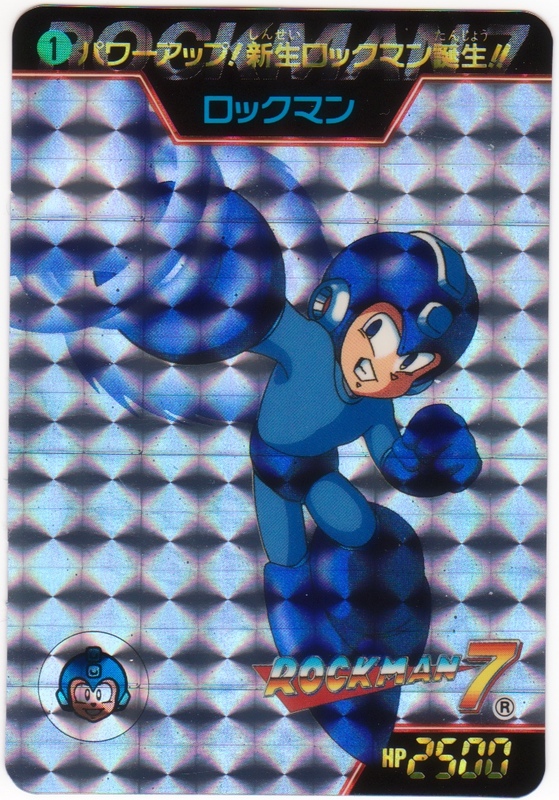 In true Mojo Jojo fashion, the super fighting robot Rockman wouldn’t even exist if not for him! 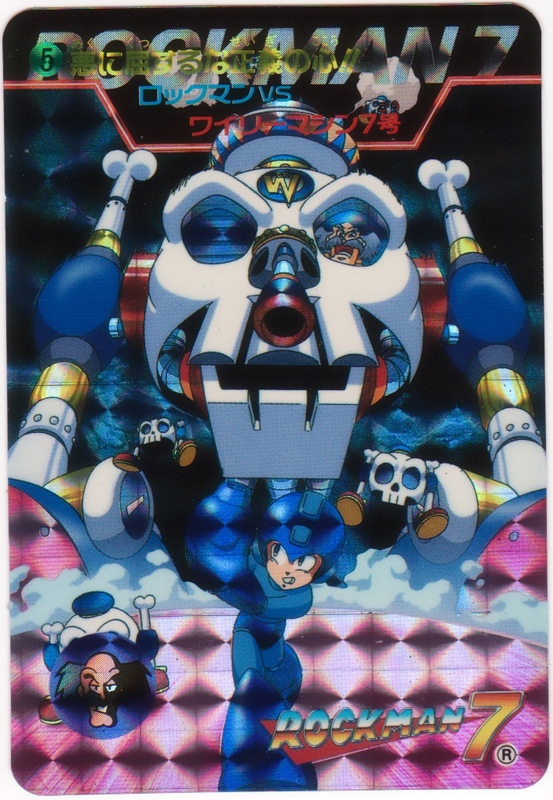 So in addition to Rockman, this celebration is also for Dr. Wily, without whom this series would not have occurred at all! 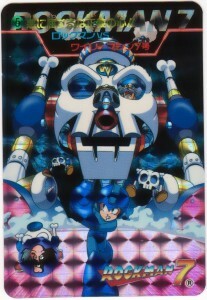 In this scene from Rockman 7, Wily pulls out one of his toughest combat vehicles yet to battle Rockman. 5. His righteous heart will never yield to evil!! May their eternal struggle continue for years to come! Tomorrow: It’s the final countdown! 2 Comments to "Carddas Countdown Celebration: 2, 1…"
That form isn’t so bad, it’s the capsule after it that’s really punishing! Or so I’ve always thought. I’ve seen videos on YouTube where people have avoided every shot perfectly and make it look easy. I think the best I’ve ever done is only using 1 E-tank, and that was only because I only had the one left and just got lucky with getting the last shot in before he took my last few bars of life. I still remember that fight.